Photo: Sandeep MM. Creative Commons BY-NC (cropped). Urbanisation is one of the leading global trends having a significant impact on health. The World Health Organization estimates that more than 70 percent of the world’s population will live in cities by the middle of this century. Unfortunately, these transformations are happening too quickly but in unplanned way and thus many municipalities are unable to find the proper balance necessary for preventing a range of symptoms from developing, which can leave a city rather sick and in turn impact the well-being of residents. Transport — less than 500 metres (via paved footpath wide enough for a wheelchair) to a bus, train or tram stop with regular services of at least every 30 minutes, off peak. Food and goods — less than 500 meters to shops. Green space — less than 500 metres to parks. Access — less than 30 minutes by mass transit to a range of employment, education, social and cultural opportunities; safe walking and cycling paths to a primary and secondary school. Housing — a mix of housing types and prices, suitable for living, housing built, or adapted, using environmental principles; good outdoor and indoor air quality. Social cohesion — a sense of community in the neighborhood; tolerant and safe environment. Of course, just as not all of us humans were graced with the genetic and environmental assets that confer perfect health, not all urban development is ideal. In fact, the situation in many developing countries is quite different and sadly, ‘sick cities’ abound. However, like many humans of less than ideal physiology who commit to conditioning themselves and improving their health by employing scientific knowledge and planning, cities can take a similar approach. Here, we will discuss the scenario for developing countries like Bangladesh where the vast majority of people are still unserved by basic infrastructure and are already the least able to cope with the increasing impacts of climate change. Indeed, in developing countries, most of the urban population does not benefit from the “urban advantage” of better access to health care, as improvements in living conditions and health provision are not keeping pace with urbanisation. These city dwellers instead face what has been labelled as the “urban penalty”: deteriorating health status due to inadequate access to basic infrastructure or exposure to worsening environmental pollution. Additionally, the typically sedentary urban lifestyle of the growing middle class, with more convenient access to safe water and food, etc., creates new health risks such as diabetes and cardiovascular conditions. South Asia’s cities are particularly vulnerable due to the additional impact of climate change on all sectors; human health, food production, infrastructure, water and ecosystems. 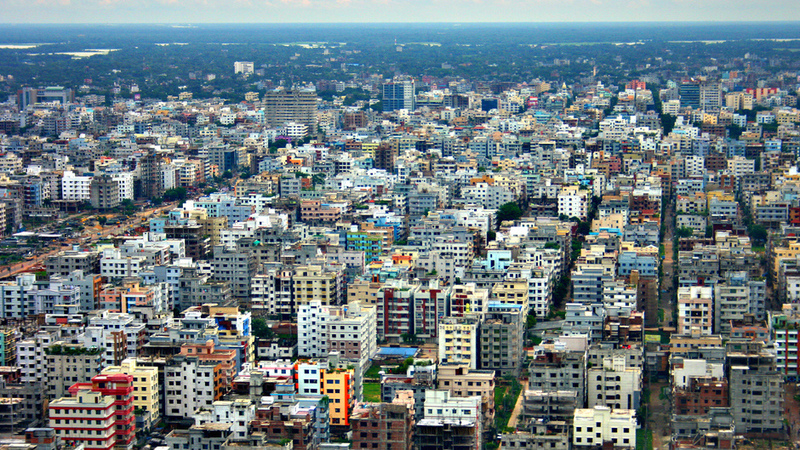 Bangladesh’s capital, Dhaka City, is one of the major cities of South Asia. With an estimated population of more than 15 million people, it is the largest city in Bangladesh and the 8th largest city in the world. It is also one of the world’s most densely populated cities. 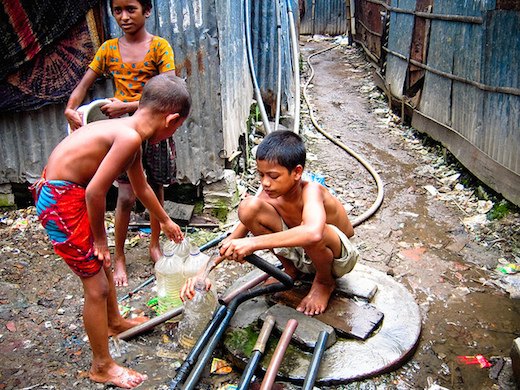 Viral diseases and communicable diseases are increasing in Dhaka City due to poor hygiene and sanitation systems in the slums. Photo: Development Planning Unit University College London. Creative Commons BY (cropped). Bangladesh has shown substantial success with respect to health and development over the past few years. Accomplishments include achieving Millenium Development Goal (MDG) 4 for the reduction of mortality amongst children under age 5 and making remarkable progress towards MDG 5 for improved maternal health. However, the rapid growth of cities and towns is the greatest development challenge for the country. Over the past 40 years the proportion of the population living in urban areas in Bangladesh has increased from 5 percent to 28 percent, with estimates predicting that just under one third of the total population will live in urban areas by 2015. The country’s growing cities and towns face challenges that include high percentages of people living in slums, high cost of living and dominance of the informal sector, inadequate basic services (especially water, sanitation and energy), unplanned urban and pre-urban expansion, social and political conflict over land resources, a high level of vulnerability to natural disasters and poor mobility systems. Thus, just as the size of the urban population is growing fast, so too is the scale of the challenge for urban health. Viral diseases and communicable diseases are increasing in Dhaka City due to poor hygiene and sanitation systems in the slums. In fact, in the country’s slums the mortality rate of children under 5 years old is almost double that of rural areas. On top of that, air pollution is worsening. Bangladesh was ranked fourth among 91 countries with the worst urban air quality in the latest air pollution monitoring report by the World Health Organization. Data from the National Institute of Diseases of the Chest and Hospital shows that nearly seven million Bangladeshis suffer from asthma and more than half of them are children. In Dhaka alone, an estimated 15,000 premature deaths, as well as several million cases of pulmonary, respiratory and neurological illness are attributed to poor air quality, according to the Air Quality Management Project, funded by the government and the World Bank. In recent years, rural to urban migration is a major factor in Bangladesh’s urbanisation and climate change is contributing on that front. In Kamrangirchar (a sub-district of Dhaka City) a huge number of migrants moved from the southern districts that are part of the Barisal Division of Bangladesh after disasters like November 2007’s Sidor cyclone, which killed more than 4,000 people, and cyclone Aila that hit in May 2009 and left 8,000 more missing and about 1 million homeless. Twenty-two percent of those affected by Aila moved to Dhaka and 78 percent moved to other cities close to their home. Though Bangladesh has become a role model for the United Nations to be showcased for its excellent development performance and success in poverty alleviation, as described above, many challenges remain. Significant factors influencing urban health in Dhaka City include urban governance, population characteristics, the built environment, social and economic development, services and health emergency management, climate change and food security. Simple, practical, and user-friendly solutions are needed towards achieving sustainable urban environments. For example, various dimensions of urban poverty — including economic empowerment, improving living standards and land tenure security — have to be addressed. If cities and towns are to successfully play their role as a driving force behind economic and social development, challenges have to be addressed through effective planning and governance. Existing solutions, such as those already trialled by NGOs (examples include success in contraception use and reduction in maternal and child mortality rates), can be put into wider practice through coordination between various ministries, NGOs, and the private sector. The Urban Management Unit of Bangladesh’s Local Government Engineering Department (under the ministry of Local Government, Rural Development & Cooperatives) takes on the challenge of assisting local bodies in improving the quality of life of people in urban Bangladesh through initiatives undertaken with the relevant stakeholders. Further, the government of Bangladesh and the World Bank in April launched the Municipal Governance and Service Project to improve municipal governance and basic urban services in city corporations and municipalities in Bangladesh. In addition, government and other development agencies need to take more initiative for additional integrated programs for developing urban structure, climate change mitigation and emergency preparedness planning. 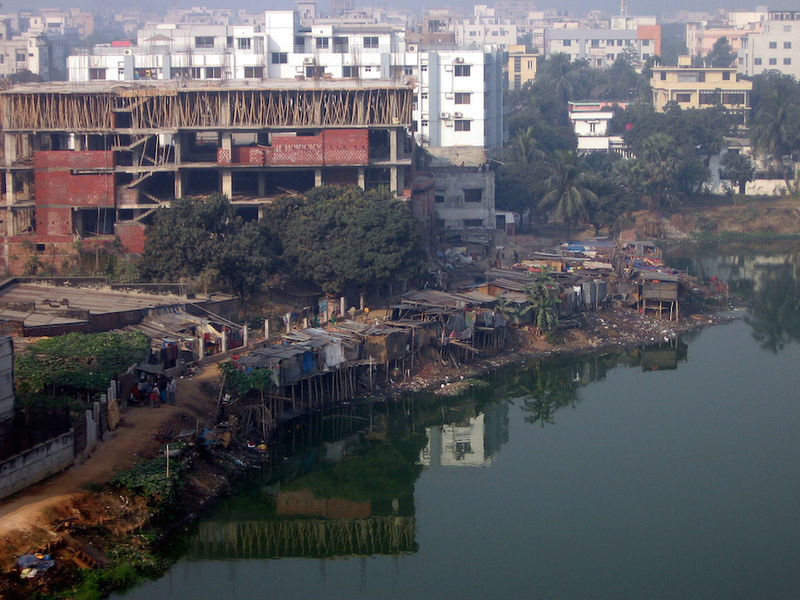 Located on the Buriganga River in the heart of the Bengal delta, Dhaka is an extremely vulnerable city. Photo: Stefano F. Creative Commons BY-NC-SA. (cropped). The country has begun work towards changing some relevant institutional, legal and regulatory frameworks. For example, smoke from brick kilns contributes to air pollution in Dhaka and other cities. So, adoption of cleaner technologies and their full implementation can go a long way towards making the country’s urban areas safer. A new Brick Making and Brick Field Establishment (Control) Act that will be enacted on July 1 prohibits operation of the old-fashioned brick fields that are largely to blame for air pollution. Apart from work towards establishing cleaner brick-making technologies, the new law prohibits the establishment of brickfields in residential, protected, commercial and agricultural areas, and also in forests, sanctuaries, wetlands and Ecologically Critical Areas. The national government also recently announced wider reaching measures, such as a “green tax”. “We are considering imposition of the tax as surcharge on the most polluting industries. The tax will act as disincentive for pollution and thereby encourage for taking measures to control pollution,” said a senior official of the National Board of Revenue. Apart from brick kilns, the leather and dyeing and shipbreaking industries also contribute to environmental pollution, she said. Social and economic factors are also key to boosting urban health. Bangladesh needs to learn from the evidence from other countries including Brazil, China and India on how reducing inequalities yields larger dividends for poverty reduction than a more conventional focus on economic growth. Furthermore, Bangladesh can also take lessons from China’s experience to create decentralised economic opportunities in smaller cities and district towns so as to mitigate the influx of rural migrants into overcrowded areas in major cities. With strengthened partnerships, strong leadership and government commitment, Dhaka has the potential to become a popular, flourishing and healthy city. Sick Cities: A Scenario for Dhaka City by Anthony Capon, Atsuro Tsutsumi and Syed Emdadul Haque is licensed under a Creative Commons Attribution-NonCommercial-ShareAlike 4.0 International License. Syed Emdadul Haque is a Postdoctoral Fellow at the United Nations University International Institute for Global Health (UNU-IIGH). Dr. Haque has been a public health researcher since 2000. His research interests include noncommunicable diseases centring on mental health. Recently he has focused his study on mental well-being and disability as a global priority. He is an expert on designing and conducting field research as well as data analysis in qualitative methods.